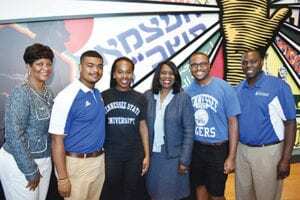 NASHVILLE, TN (TSU News Service) — Tennessee State University alums converged on Atlanta for the 2018 National Alumni Association Convention. 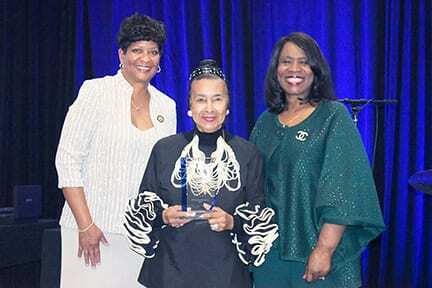 TSU President Glenda Glover was among the nearly 200 alumnus who attended the convention from June 13-16. “I enjoyed just fellowshipping with all the alums that were there, and seeing a lot of the younger alums coming out,” said McReynolds, who was recently re-elected to another two-year term. On Saturday, President Glover updated alumni on advancements the university has made in the areas of retention, recruitment, enrollment and marketing. She also informed attendees about upcoming changes to the campus landscape, including the addition of a new Health Sciences Building, two new residence halls, the Field Research Organic Laboratory, the Gateway Arch Entrance, a new engineering building and the Alumni House and Welcome Center. One of the highlights of this year’s convention was an honors gala that recognized several outstanding alumni. Two of those alumni – James Shaw, Jr. and Derrell Vaughn – were honored for their courage. Shaw received the “Hero Award” for disarming a shooter at a Waffle House in Antioch, Tennessee, in April; and Vaughn received the “Bravery Award” for trying to save the life of a man during the mass shooting in Las Vegas in October. Earlier this year, TSU recognized local alumni achievers during a special “Toast to TSU” event at First Tennessee Park in Nashville. Calling them its “Points of Pride,” the university recognized TSU graduates or former students who are prominent and emerging leaders with universally recognized success in their fields, and who have made a positive impact on the TSU brand and community. The next National Alumni Convention is scheduled for 2020 in Florida. The city has not been announced.